East Side looks pretty lonely on that map. I realize some of these routes are extremely long. The only reason for that is I ran out of room for more route names. Very minor suggestion - on the orange line, Trillium Park is the less logical stop than the St Anthony Shopping Center, which both has parking and potential destinations, whereas Trillium Park is basically just a small green space that no one uses. So, I'm not sure how many of you have played with the enmodal app. It's an online transit map generator that sort of takes out a lot of the manual work. It's quite interesting to play with in general, and has a few cities by default. I've made a super rough version of the lines around here. It's not perfect (I can't figure out how to actually make the lines follow the exact curves), but if people are interested in using it as a basis for playing around and making fantasy maps, I wanted to share it. (Note: it starts zoomed in on New York for some reason, but you can redirect to the Twin Cities manually of course). In theory, this should create a clone of the app so you can save your own working versions, I hope. First time I've tried to share something this way on it, so we'll see if it works like I think it should. I also deliberately didn't make the Northstar a separate layer - I actually started doing it, but then it wouldn't let me create an interchange at Target Field, so I just threw it all on one. You're of course welcome to make a commuter rail layer differently in your own versions if you want to play with expanding it more! 1. Switch one-way pair to be Lake/31st instead of Lagoon/Lake, and extend to east of 35W. Goal: to provide better access from CSAHs 3/5/25 to the west to Lyndale, and to take pressure off constrained Lagoon. 2. Access-manage and widen Lyndale. Add a center median and roundabout at key intersections. Allow right-in/right-out only from driveways and other intersections. Goal: provide a through route that is less damaging to local business frontage than Hennepin. Reduce crash risk over current design, and manage speed over simply widening. 3. Convert Hennepin to a 2- or 3-lane pedestrian focused street. 4. To discourage regional use of Hennepin, remove accesses to TH 94 and convert 26th/28th to two-way west of Lyndale. I suppose you could end the one-way pair at Lyndale instead of Chicago. My assumption was that it would make sense to go past 35W, given the ramp configuration. Chicago is the cut-off for another pair of one-way pairs, so that made sense. The whole point is to divert traffic that might otherwise use Hennepin to Lyndale, which has much less pedestrian frontage, less transit, etc -- and could probably better support a right-sized divided section. If you were to do the pairs only to Lyndale, I think you'd have a net decrease in one-ways (removing one-way on Lagoon, and the western portions of 26th and 28th). I was picturing something like this as a cross section on Lyndale (alternating which side has parking either every other block, or between roundabouts): https://streetmix.net/-/561225. Matches existing 85' ROW. If you used only roundabouts and used closed median throughout otherwise, you would not need a median wide enough for center turn lanes. That Lyndale layout could work if the outer lanes were for transit instead of cars. Four lanes for cars seems far too excessive and contrary to our modal priority framework. There would have to be serious thought before removing 94 access from Hennepin. Both the Lyndale and Hennepin entrances are bogged up during rush hour. So is Franklin at 5th. I like the idea of limiting access but I suspect it would need a complete reconfiguration of the interchange. Something I'd love to see but is not going to happen in my lifetime. At least I would be very surprised (and pleased) if it did. No way we should widen Lyndale. It's already four lanes. I don't see how roundabouts would fit without significant takings. I love the idea of 4-3ing Hennepin. It needs a dedicated bike lane or two. But again, practically speaking, how would it work without making Lyndale much worse than it already is? Until we get a subway in the area, I just don't see how we can make such disruptive changes. I think Hennepin would make a great rail/bike corridor, with limited slip lanes/parking for retail access. I do find that idea intriguing. Lyndale is really worst at Franklin and The Wedge, both due to left-turners. Address that and a lot of the congestion problems on southbound Lyndale are greatly reduced. Northbound slows at the 94 entrance and into the bottleneck and I'm not sure how to address that. Maybe a reduction in traffic from Northbound Hennepin would help. Address these issues and then maybe there is room to divert from Hennepin. I suspect we would need more signals on Lyndale as cross traffic would increase. It's nearly impossible to cross at non-signalized intersections as it is. Has anyone ever modeled the effects of making this kind of change? My idea is that all accesses other than the roundabouts become right-in/right-out only. So if coming from SB Lyndale and you want to go the Wedge, you would proceed until the roundabout at 24th St (1.5 blocks), do a U-turn at the roundabout, and come back north to the Wedge driveway. That sounds tedious, but compared to the street and danger of trying to find a gap in NB and sidewalk traffic (while holding up SB traffic), it's a lot easier. Similarly, uncontrolled crossings would have a closed median. So going EB on 25th, you'd turn right, make a U-turn at 26th, and a right turn on 25th. Unfortunately, I don't have the skills or resources to model this out beyond a simple fantasy. My assumption is that the biggest issue would be that 24th might not have enough traffic to balance a roundabout. What if instead of worrying first about where cars will go, we designed the streets to work best for peds/bikes/transit and then let people in SOVs who aren't using the freeways (ie, people going to/from downtown or nearby destinations) switch modes or departure times, and people who ARE using the freeways simply shift their departure times or routes (e.g. head west out of Uptown to Hwy 100 instead of north to reach 94 or 394). Lyndale needs significant traffic calming, as much as Hennepin does. So does Lake St, and 31st is already way, way too wide (even though it doesn't have the commercial presence and thus ped traffic of a Lake St). While I am more open to the idea of heavily-calmed one-way pairs that open up the possibility of bike infra or dedicated bus lanes where you couldn't politically do that on only one street (I've advocated for this on Lagoon/Lake), it simply won't happen. And honestly, the traffic volumes on Lake St don't warrant additional lanes - Steven Ave makes for a good "pre-on ramp" to 35W SB. Traffic on these streets has been declining for a while, even during the recent population boom (which includes both the many new apartments but also the less-discussed turnover in SFH with younger families with more workers per HH than previous dwellers). Add in the fact that NB 35W is getting a new ramp to EB 28th - relieving pressure on Lake St - and I just don't see how any of this is necessary. What's the upshot for Lyndale, though? Today it feels like the worst of all worlds -- some cars are going 40, while some are going 0, stuck behind left-turning cars. Pedestrian crossing is sometimes deadly. Going to 3 lanes is not acceptable to the County. Given the county jurisdiction, going down in capacity in a meaningful way probably isn't feasible, while going up might be. My idea is just to see that scenario on an area-wide scale: make Lyndale more efficient for auto traffic and use that capacity in conjunction with a reduction on Hennepin. Together, Lake and Lagoon carry 30,000 cars a day. Is it really feasible to have that as a 4-lane undivided? Would we want that even if we could have it? Personally, I'd rather see one-way pairs with two lanes in each direction and generous, quality bike lanes. It seems that 31st is better suited to being part of that one-way pair than Lagoon is. The city should make 3 lanes "acceptable" to the county up to and including turning it back to the city. Three lanes with strategic medians would be great, along with great bus stops and maybe bus advantage and bike lanes. Make it happen! Yeah, the upshot for Lyndale is to be a safer street that people can actually cross and bike on, with all sorts of potential for some transit priority. The county could look at the street, even under their own broad goals of moving people across the county, with a multimodal lens and see that a 3-lane profile with transit advantages (skip lanes, signal preemption, etc) and a protected bike lane might actually move *more* people than it does now (and safer). But even if it didn't, it should be in the county's best interest to foster (rather than inhibit) the type of growth (both residential and commercial) developers are clearly clamoring to build along it - expanding both the city and county's tax base at no additional cost to them. I also hear Hennepin County spends a good chunk of its budget on health and human services, and that car crashes are a contributor to them. Like I said, I have advocated (in the lamest, message board/twitter way) for a pair of heavily calmed streets in Lagoon/Lake - taking away a parking and/or thru-lane for a wider ped realm and maybe raised bike lanes. And even then, I think about how hard it is to cross, say, Blaisdell Ave between Franklin and 29th. This is a 2-lane one way with parking to calm the left lane and a bike lane on the right. Could it be calmer with slightly narrower lanes and/or some vertical elements in the bike lane? For sure. But we'd need to dip so far below the county's lane width and (lol) reaction zone to make a 2-lane one way a street where someone can legitimately walk up and cross. And even then, I really don't see the justification for continuing a one-way pair east of Dupont from an AADT perspective. Lake St aBRT + Midtown Rail + Greenway bike facility + 26th/28th protected bike lanes + some bike facility on 31st from the lake to ??? 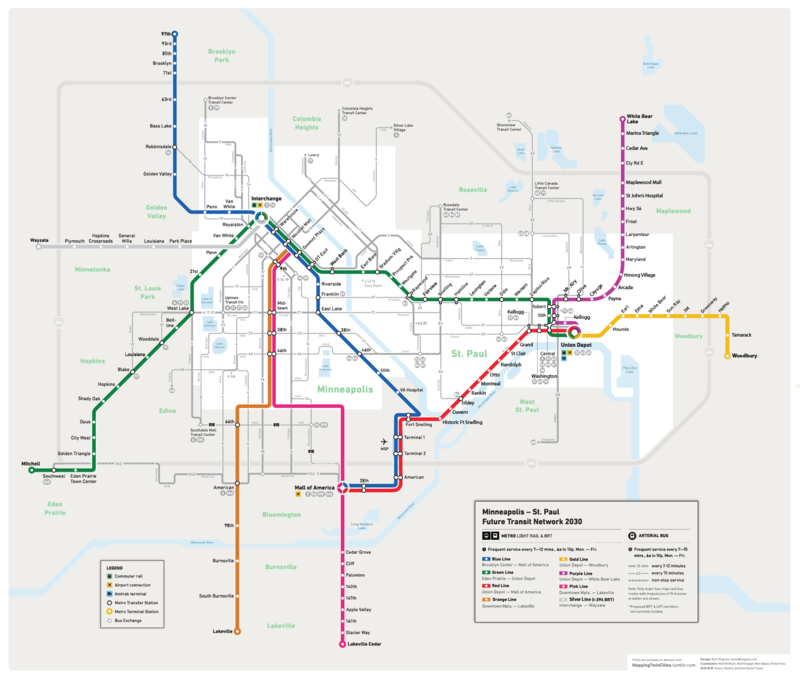 should make for a very compelling set of alternatives to travel within the corridor (Calhoun to Portland) and also connecting to the broader region (connections to SWLRT, Blue Line, Chicago aBRT, Orange Line, all the bike trails). We are, at least in a fantasy map realm, going to have all these things we didn't have 20, 30 years ago when counties set their road capacity requirements (and projections) in stone. Again, my intent with showing one-ways farther east is just to encourage traffic to use Lyndale as the N-S through street in this area, and not Hennepin. As it is designed currently, there is a lot of capacity to turn left on Hennepin (double-left turn lanes with no conflict of oncoming vehicles), and little-to-no capacity to turn left on Lyndale -- it is prohibited certain times of the day, and no left turn lane exists any time of the day. This clearly favors going up Hennepin to downtown when coming from CSAH 5/3/25 to the west. I'm sure there are other ways to hit this goal. An alternative fantasy might be keeping existing one-way configurations, but having a roundabout at Lyndale/Lake. Given short east-west blocks and demands for parking, it is hard to get a left turn lane of any reasonable length in at the signal. And I agree there are many other things you could do with Lagoon, but it is still a very constrained right-of-way, with high-density housing right at the back of sidewalk for most of it. 31st has a wider platted right-of-way, and if it needed to expand, it could be done so with much less destruction than Lagoon. And you're right, things are getting better, and if we're truly taking fantasy to fantasy, a more complete bike-ped and transit network should take pressure of the roadway network, period. Consider this a "pragmatic fantasy" to surrender a bit of auto-orientation on Lyndale (but probably still improve safety and aesthetics) in order to build out a better Hennepin. Sdho, really well argued. I enjoyed reading your posts. Thanks for sharing.